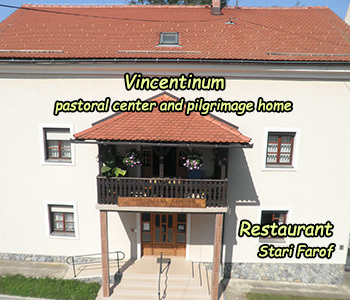 We will be pleased to welcome you in the restaurant Stari Farof within the Vincentinum complex no matter if you are staying at our pastoral center and pilgrimage home or have chosen our restaurant by chance. 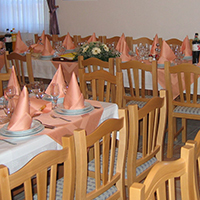 We can organize events for you, and our staff is always ready to fulfill your preferences. We can arrange private parties, gala events, business lunches or simply a family lunch. We will be happy to organize christenings, confirmations, anniversaries, birthday and nameday celebrations, receptions, smaller wedding receptions, celebrations and we also organize funeral feasts to enable you to say goodbye to your loved ones together with your families and friends in a dignified way. Our restaurant offer is based on local and traditional dishes and the use of fresh seasonal ingredients. Offer can be tailored according to your liking whether they are individual requirements, group menus or special celebrations, and we also have a la carte menu. 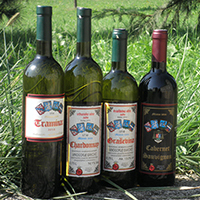 Good food always comes with good wine and wine lovers will surely enjoy the excellent flavors of communion wines such as Traminac, Chardonnay, Riesling, Cabernet Sauvignon. In the restaurant offer you will also find the inevitable apperitives and digestives made by the thousand-year-old local tradition of making liqueur and other beverages from 19 healing herbs of Velebit. In the winter time the restaurant can serve up to 50 people in dinning room and 20 people in the cafeteria while in the summer period there is an open terrace where we can accommodate another 30 people. The restaurant also provides the service of roasting the lamb or suckling pig on a spit as well as the cutting service. Restaurant Stari Farof opening hours: Monday, Tuesday: 9 - 17h, Wednesday, Thursday, Friday, Saturday: 9-22h, Sunday: 8-16h. For the Vincentinum guests and groups working hours may be prolonged, upon prior agreement.